Habits are difficult to break, especially if you’ve lived with them for decades. However, it doesn’t mean that there’s no hope in changing the way you live your life. Although it’s really tough to go against your customary activities, you can start small and inch your way towards getting rid of the habit. Unless you’re already a fitness buff or a nutrition expert, you’re probably experiencing bad eating habits. These can come in the form of not eating at the right time, or picking the wrong kinds of food. Whatever it is, remember that you can change the way you eat as long as you have the willpower to do so. If you’re thinking about eating healthier, you may start by getting rid of junk food. This unhealthy food choice brings about a lot of health risks, caused mainly by lack of nutrition. According to a study reported in WebMD, junk food (and particularly fast food) contains low fiber, high calorie content, and high amounts of sugar and fat. Before you continue reading this article, can we agree that junk food is bad for health? Good. Now that we’re on the same page, the best way to get rid of your junk food addiction is to replace them with healthier alternatives. “While completely avoiding junk food is practically impossible, at the very least, you can satisfy your cravings by replacing junk foods with healthy substitutes,”. I’ll be sharing some suggestions on what you can eat in place of popular junk food items. A condition known as “popcorn lung” rose to infamy in the early 2000s after workers in a microwave popcorn factory were reported to have a high incidence of the disease. 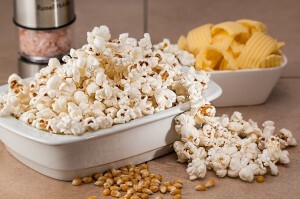 This health scare, described by MedicineNet.com as “a serious and irreversible condition in which the tiny air sacs in the lungs become scarred”, was caused by a compound named diacetyl that gives the popcorn its buttery aroma. You don’t want to harm your lungs just because you want to chew on something while watching your favorite movie, right? If that’s the case, then you need to avoid microwave popcorn and prepare your own homemade organic popcorn. A typical bag of potato chips contains so much fat, which is never a great addition to your healthy diet. 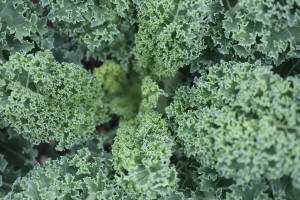 Instead of the ultra-fatty potato chips, you can use fresh kale to prepare your own kale chips. You may also look for pre-made kale chips in your local store if you don’t have time to make them yourself. French fries can already be placed alongside popcorn and potato chips in terms of popularity, especially among fast food lovers. Unfortunately, a typical serving of French fries contains so much salt, calories, and trans fat enough to kiss your diet plans goodbye. Switch to a better alternative in the form of sweet potato wedges. Sweet potato has more antioxidants than the same amount of potatoes. Make sure that you prepare the sweet potato wedges with olive oil and significantly less salt. More importantly, skip the deep fryer and send the wedges to a hot oven or on top of the grill. Apart from providing sweetness and temporary satisfaction, candy does little benefit to the body. It consists primarily of sugar, with no protein, vitamins and minerals, or fiber. Eating candy will merely increase your risk of diabetes, obesity, and tooth decay. Sure, dried fruit may not be as tasty as candy, nor can it lure children to give up their candy cravings. However, choosing this healthier alternative will save you and your family from potential health hazards. 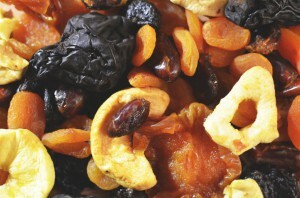 Some of the best dried fruit variants include apricots, raisins, dates, or figs. On your next birthday party or special occasion, try to do away with traditional cakes because most of them contain loads of sugar and calories. A healthier substitute is banana bread, particularly if it’s made with whole-wheat flour and some nuts. It may not be as festive, but at least you’ll have an extended life to enjoy more years of joy and celebration. 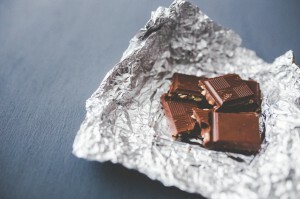 The original version of the decadent chocolate comes from real cacao beans, but some chocolate products now contain less of the chocolate and more of vegetable oils and milk. As a result, the health benefits of chocolate are compromised due to the unhealthy components mixed with it. If you’re craving for chocolates, skip the branded milk-based variants and choose organic dark chocolate instead. Don’t let its innocent looks deceive you. Sure, it tastes amazing and looks smooth and creamy, but ice cream is full of calories and fat. Instead of buying a tub of your favorite ice cream, switch to organic yogurt. 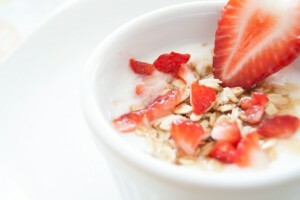 This substitute contains a good amount of calcium, while probiotic yogurt improves the digestive system. Soda does nothing to the human body except to increase the risk of obesity and diabetes. 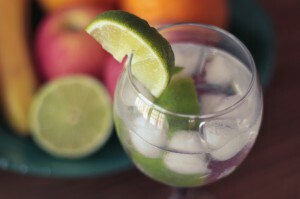 If you’re looking for something to replace soda but still retain the kick that you feel every time you drink a glass, your best bet is a glass of water with a quick squeeze of lime or lemon. The citrus fruit adds a zest that will excite the bland taste of water, and it also provides Vitamin C and cancer-busting flavonoids. Fatty and unhealthy food items may be in your fridge right now! Take out these sinful foods and replace them with healthier options listed above. In time – and if you can sustain this good habit – you can see yourself with less fat around your waist and an overall better health. As a certified nutritionist, Jon Navarro envisions health as the primary driving force to help people live longer. His passion for nutrition and well-being resonates in his blog www.healthexcellence.net , which Jon created to help people follow proper eating habits and take care of the physical body and the spirit.